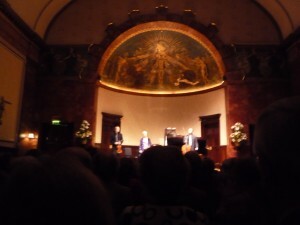 Here are a couple of reviews of the Florestan Trio’s Beethoven trio concerts in the Wigmore Hall this week. The series came to a memorable close on 13 January with a standing ovation from the Wigmore audience. This entry was posted on Wednesday 11th January 2012 at 12:08pm	and is filed under Florestan Trio, Reviews. You can leave a response, or trackback from your own site. Wonderful reviews, Susan, but I’m not surprised honestly!! I concur with the hope expressed by the writer of the Independent one that there will be a new chamber group with you at the helm! It was exactly as the reviews said – your authority at the piano – that made me sit up several years ago and tell my wife I had heard this wonderful pianist playing the Brahms piano quartets with Domus!! I’m so looking forward to your two remaining Mozart performances at Perth!! I wonder, well these performances be broadcast so that international fans can have chance to say good bye? The performances were not recorded, James – in any case, I don’t imagine that recordings could capture the special atmosphere of the live concerts.